The most powerful generator in the line, the DCA-150USJ2C has all the features users have come to expect from WhisperWatts and much more. It has a patented “Ultra-Silent” air flow design for quieter operation, an environmentally friendly full fluid and fuel containment system, and a fuel-efficient EPA-approved Tier III John Deere diesel engine 6068HF285. 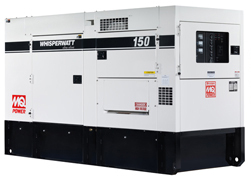 The DCA-150USJ2C produces power to the tune of 165kVA/132kW (standby) and 150kVA/120kW (prime).